It has been announced that Rage 2 will be getting yet another preorder bonus. On top of the already confirmed content, which consists of The Cult of the Death God mission, centered around a cult of mutants that has begun worshipping Nicholas Raine, the original game’s protagonist, the Settler Pistol and the Arkist Armor that both belonged to Raine, and the Mutant Monster Truck Skin, now players who pre-order Rage 2 can also look forward to hearing Tim Kitzrow belt out over-the-top lines when defeating foes via a preorder cheat code. A few of Kitzrow’s comments were mentioned. They were “REJECTED”, “He’s heating up”, “He’s on fire”, “Let’s RAGE”, “Pow Pow Puppy Chow”, “Should’ve had your vitamins,”Talk to the hand”, and “BOOMSHAKALAKA!” This Rage 2 preorder bonus is my favorite so far. You can check out the lines for yourself in the new trailer! If you don’t know Kitzrow, he lent his iconic voice to many memorable sports games from the past. The most notable examples of include NBA Jam, NFL Blitz, NHL Hitz, and MLB Slugfest. 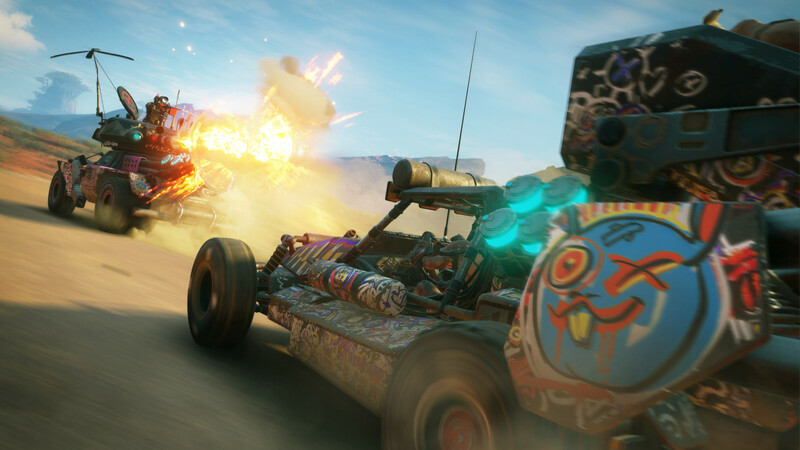 Rage 2 brings together the minds behind DOOM and the Just Cause series to bring the best of both worlds to the forefront in a post-apocalyptic setting filled to the brim with guns, cars, and mutants. Id Software has been making legendary first-person shooters for years and Avalanche Studios is an expert in destruction and open-world chaos, so this game is bound to be fun. The world of Rage 2 is brutal and filled with various types of enemies to fight. This includes mutants of multiple sizes, different gangs of Raiders, and a ton of crazy characters to come across and complete missions for. Oh, and did I mention that the vehicle combat looks absolutely amazing? Because it does. Rage 2 will launch on May 14th, 2019 for the PlayStation 4, Xbox One, and PC. Id Software’s latest is sure to satisfy all of your Mad Max needs, at least until the next movie comes out! What do you think of the latest Rage 2 preorder bonus? Let us know in the comments below!